My first plant of the month for 2017 is…. 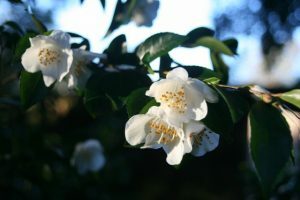 This small flowered Camellia species lights up the garden in winter and early spring (January to February in Cornwall) Covered in miniature white buds flushed pink the flowers open pure white with a contrasting group of bright yellow stamens in the centre, simple elegant and beautiful. Probably one of the easiest species to grow. Hardy, reliable, graceful and quite simply stunning.